Avenir is a sans-serif typeface designed by Adrian Frutiger and released in 1988 by Linotype GmbH. The word avenir is French for “future”. As the name suggests, the family takes inspiration from the geometric style of sans-serif typeface developed in the 1920s that took the circle as a basis, such as Erbar and Futura. Frutiger intended Avenir to be a more organic interpretation of the geometric style, more even in colour and suitable for extended text, with details recalling more traditional typefaces such as the two-storey ‘a’ and ‘t’ with a curl at the bottom, and letters such as the ‘o’ that are not exact, perfect circles but optically corrected. 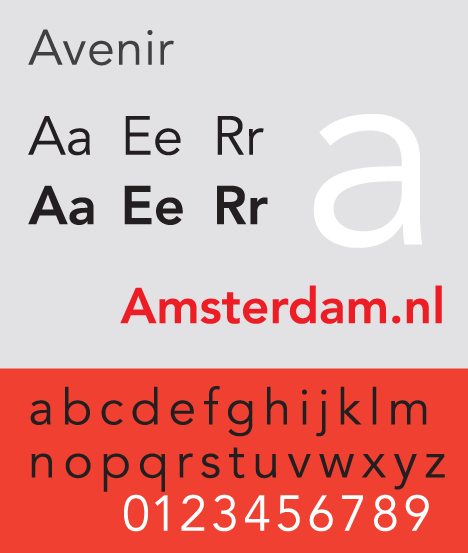 The city of Amsterdam uses Avenir as the principal typeface in its corporate identity. In 2008, Wake Forest University adopted Avenir as its primary sans-serif typeface. Avenir was formerly used by the Eurovision Song Contest in all its brand communication materials and was used between 2014 and 2017 for the scoreboards of the Junior Eurovision Song Contest. A modified version of Avenir Next was created for Best Buy. Apple used Avenir for its Maps app and some Siri screens in iOS 6. François Hollande used Avenir on his campaign materials during the 2012 French presidential election. The State University of New York, Plattsburgh uses Avenir as the main font in their branding guidelines. Bloomberg uses a custom-made package of Avenir Next specifically produced by Linotype as their corporate typeface.